...we shot a 14-hour wedding in the Berlin countryside until 2am, then caught a cab to the airport and went on a flight straight to Barcelona. After a day or two of walking the streets, exploring old book shops I knew from my earlier visits and eating all the tapas, we caught a train towards La Bisbal. We were in adventure mode. Sleep-deprived, ecstatic, completely in love with our original home turf - Europe. We had spent the weeks before just sitting on the verandah of my friends' house in Potsdam where I grew up, watching the changing light over the fields and enjoying the endless summer days where the sun doesn't set until 9pm. We rode our bikes everywhere as I used to when I grew up and the days went by perfectly slow and simple for a little while. We were picked up by our beautiful Spanish friends and fellow wedding shooters Marti & Eva from Marie Marry Me. If you want to dream yourself away to French and Spanish castle weddings, have a look at their dreamy wedding films here... it's not about opulence or old-school glamour, more like minimalism meets epic personal style meets vintage in a castle setting. It turned out that it was Eva's 30th birthday a few days after, so I was extra glad that I had picked up a copy of 'The Little Prince' in Barcelona for her. 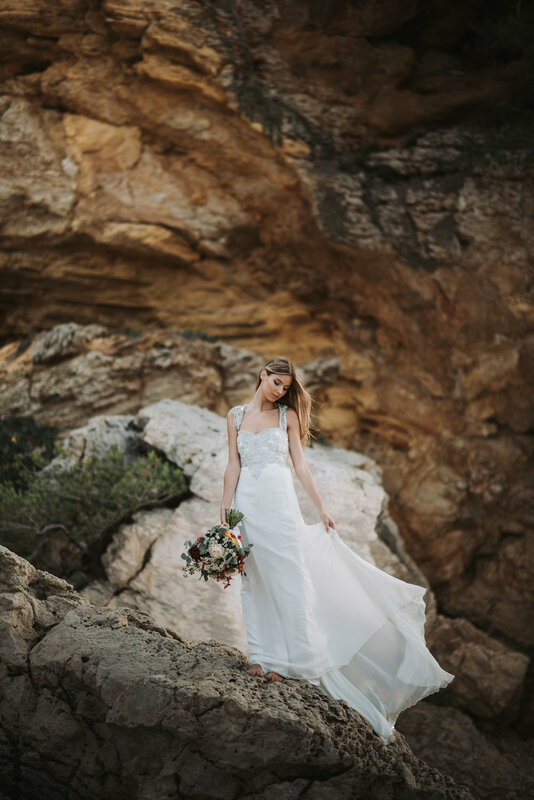 Eva & Marti had a fridge full of florals and we had flewn in Aussie bridal designer Anna Campbell's sparkly Chloé gown from overseas to take it for a spin together around the gorgeous sandy Costa Brava landscape. After a few days of scouting around the beaches and little villages, we had found our spots for the shoot. I remembered the beaches and the area from a Costa Brava hiking trip with my girlfriends in 2005. We walked for two weeks on end with 20kg backpacks on our backs, plus one of us broke her little toe on day one when we tried to run through a sprinkler at night... but that's a different story. Idamari from Berlin who made Doruk's and my wedding rings had created the earrings and wedding bands for Laura & Pau, which was extra special. We spent a golden afternoon shooting Laura and her darling Pau around the Medieval Village of Pals. The day ended with an elopement ceremony surrounded by flowers at the cliffs overlooking the beach. We photographed, Eva & Marti filmed. When we released the photos and film from this day, they got a lot of love in the media and online and were published in Ever After Magazine, Anna Campbell Bridal in Australia and Mrs P & P Wedding Blog in the UK. This year, it's Marie Marry Me's turn to visit us, so keep your eyes peeled for some Aussie collaborations to come. Eva & Marti will also be available to create beautiful engagement, elopement or wedding films for some of our November couples in Victoria, so get in touch with us if you would like to check dates & locations.